The past year saw the start of an uptrend in the hospitality sector, and this growth is likely to increase exponentially in coming years. With Indian government pushing economy through sustainable tourism industry there will be no slowing down of demand in the recent coming years. Hospitality and hotel industry are listed among most rapidly changing industries. Hotels has come long way and so is their construction. 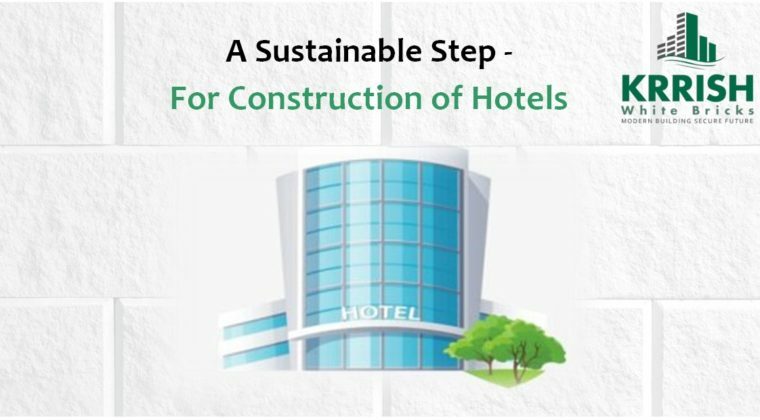 With rapidly changing architectural & design trends, category demand and necessity of being efficient, sustainable and green, it’s time for the industry to pay special consideration towards its construction. Krrish White Bricks provides broad category of products required to meet necessary demands of architectural design & sustainability in construction of Hotels. Krrish’s AAC Block & Wall panels are LEED certified green building material made up of fly ash, a residue from steel manufacturing plant. AAC blocks and panels have easy work ability and can be cut, drilled and worked around for any design specification. These blocks & panels are light weight and come in big sizes and can be adapted to any size required. AAC blocks also reduce the generation of solid waste during construction, minimize the construction time, saves manual labor and fuel used for transportation. The fire and earthquake resistance provides safety to the guests and employees. The qualities like pest resistance, sound proof, non- toxic, thermal insulation and due to its thermal efficiency ,do not require any other insulation products used for maintaining ambient temperature and thus save power for huge setups like Hotels.It is moisture resistant and also has high resistance to water penetration and environmental friendly features which make it easy for maintenance of the buildings. Krrish White Bricks have lot of prospective to change the construction scenario for Hotel Industry.